Students have periodically played an important role in campus political life as well as in societal politics. Students were active in the anti-slavery movement; they rebelled against military service in the Civil War; they staged demonstrations during the Depression; and they were vocal during the 1960s. While activism has subsided somewhat in the past three decades, students continue to be involved in significant political issues. Student Politics in America is the first book to chronicle the entire history of student political activism in America—dealing not only with the periods when students were dramatically involved in politics, but also focusing on less active periods. This book provides a sense of the entire history of political involvement and the evolution of student organizations and attitudes toward politics. Student religious organizations that have been involved in social activism are discussed, as are student government organizations, which are generally ignored in analyses of campus life. Altbach shows that, at least since the 1930s, there is an ideological trend toward liberal and radical activism, yet at the same time conservative student organizations have also been influential. Politics on the campus is a multifaceted phenomenon, and Altbach handles the complexity of student political life in a carefully nuanced manner. In a new preface, the author discusses his reasons and motivation for originally writing Student Politics in America. In his new introduction, he brings the history of student activism, and the lack thereof, up to date. 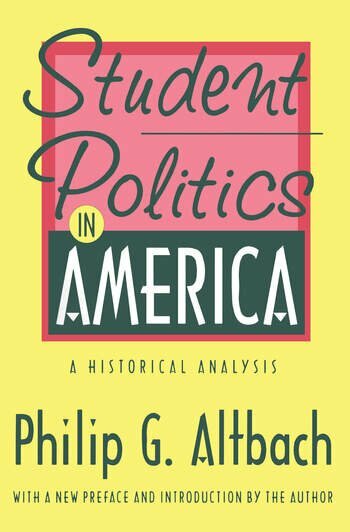 Student Politics in America provides a unique historical perspective on the political activities of college and university students in the United States and will be an important contribution to the personal libraries of educators, university administrators, students, political scientists, and historians.